"Fighting Hunger Together" is the name of the charity drive that was launched by Walmart in order to provide food pantries with supplies. Walmart will be donating $1.5 million dollars combine to six major American cities to aid the local food pantries in those cities. Walmart is using the social media website, Facebook, to determine which cities should get the green. Users of Facebook can go under Walmart's campaign, "Fighting Hunger Together", and "Like" the city that they feel deserves the money. The voting through the "Like" button will go on through December 31st, 2010. Walmart chose to 100 metropolitan areas that can be voted for. According to the Food Research and Action Center (FRAC), these areas were identified as having the highest rate of food hardship in 2010. You can view on the "Fighting Hunger Together" website what rank your chosen city has. Currently, the top three ranked cities are Fresno, California, Salt Lake City, Utah, and Columbia, South Carolina. The number one ranked city at the end of voting on December 31st will be given $1 million dollars. The next five runners up will each receive $100,000.00 for the local food banks in the area. Walmart's philanthropy should not go unnoticed. In the past the huge retail store has run multiple programs (scholarships, grant funding, volunteer work) and is known for giving back to the communities which make it thrive. In 2009, the superstore donated 100 million pounds of food to food banks in the United States. 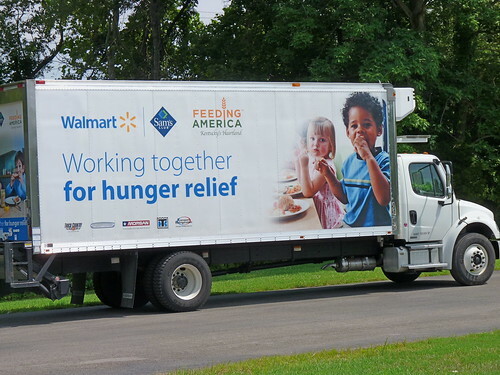 Walmart has always been "Fighting Hunger Together", will you join them? *The Fighting Hunger Together website is no longer available. However, Walmart still has a page on their website called "Fight Hunger Spark Change" that you can check out.